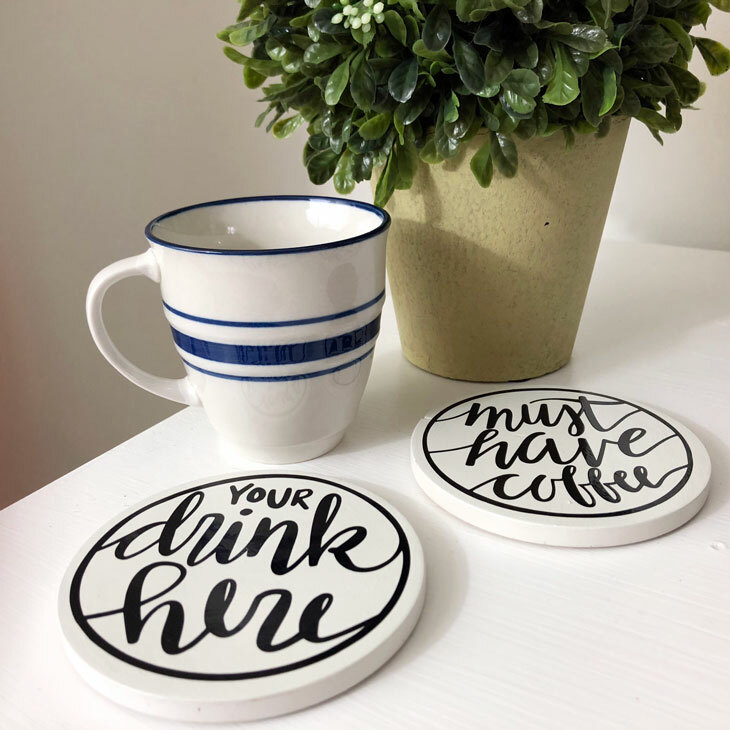 In this super simple tutorial I’m going to show you just how easy it is to make your own hand lettered drink coasters. Plus, it even includes a free download! I cannot even believe that I’ve already been in my new house for a year now! That time sure has flown by, and it’s pretty crazy how much my husband and I have accomplished in such a short amount of time. For instance, at this point in our current home renovation phase we have repainted almost every room of our house except for the bathrooms. Yikes, right?! 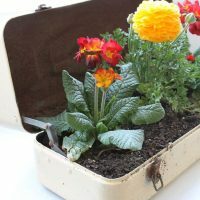 One of the cool parts about purchasing a home from previous owners is definitely all of the neat, little “treasures” that you’ll find that have been left behind. 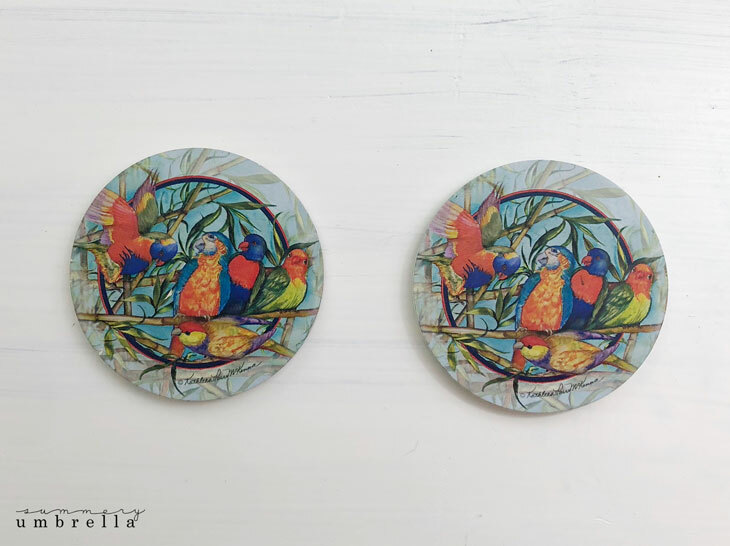 For example, a few weeks back I was cleaning and decorating above my newly painted kitchen cabinets and I found these tropical drink coasters. As you can see, the graphic(s) and coloring isn’t my style. However, I just knew that they would come in handy for a DIY project! Don’t worry if you don’t have any on hand though. You can just as easily use homemade wooden squares or something similar instead as well. 1. 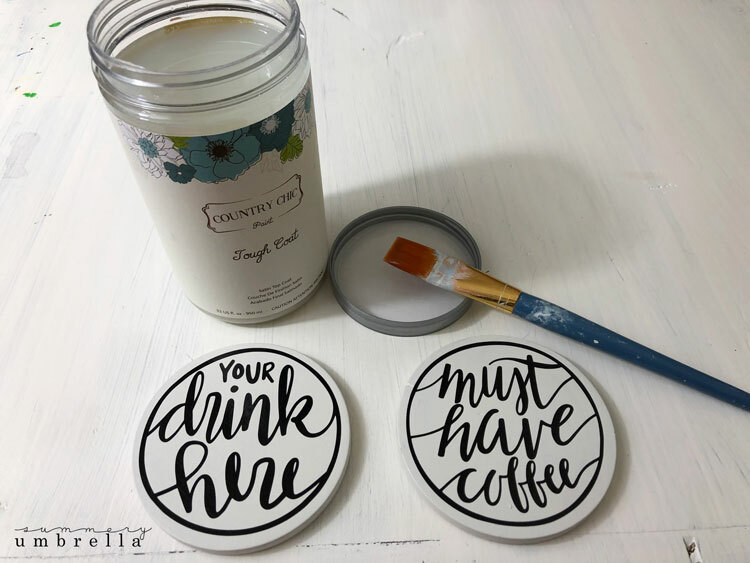 Clean and paint drink coasters. 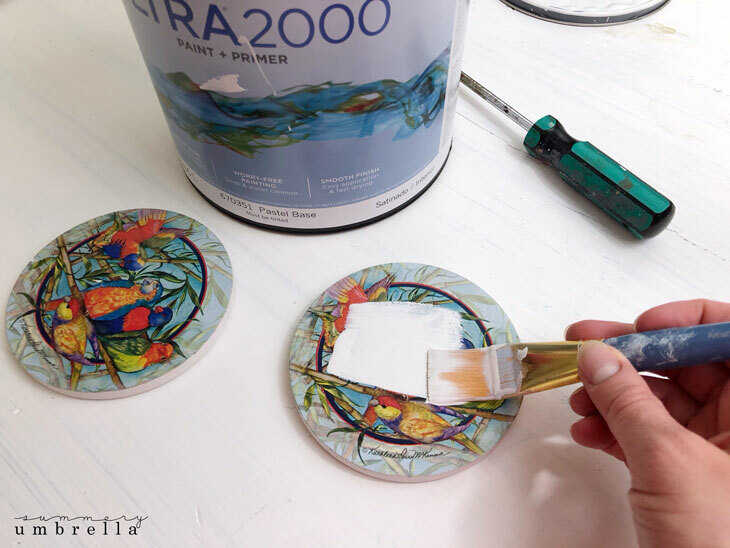 First things first, just like with any other DIY project you’ll want to clean off your drink coasters with soap and water to ensure that the paint will adhere to it. Then, dry them off thoroughly. 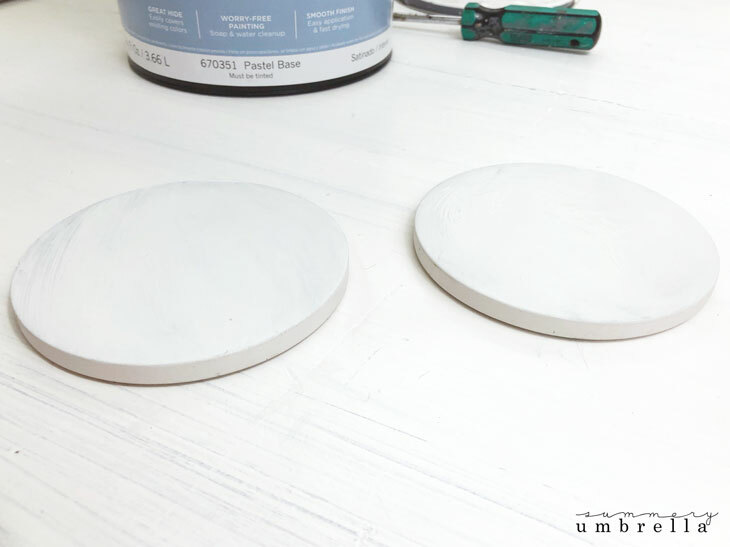 Once your coasters are good and dry go ahead and add one coat of white paint to each coaster. You’ll probably need a few coats to evenly cover your old background, but it’ll ultimately depend on the prior graphic that is on it. 2. 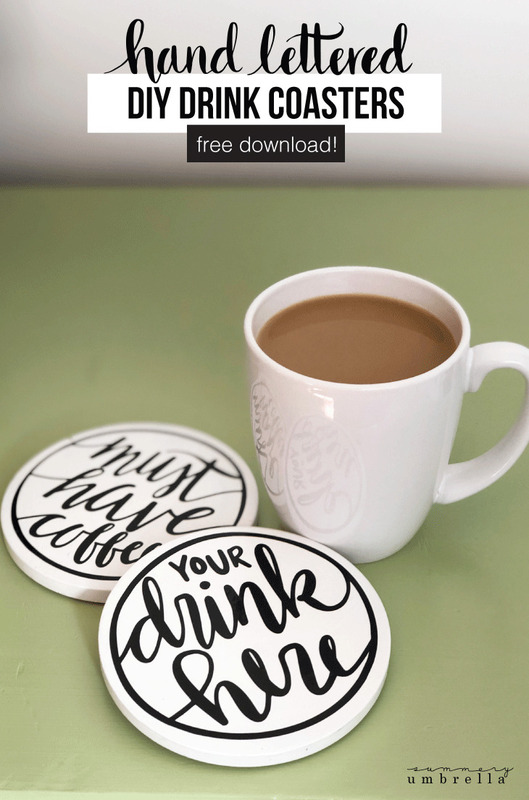 Download the drink coaster template. Allow your coasters to dry for at least a few hours. If you haven’t already, go ahead and download the drink coaster template from the supply list above and save it to your computer. 3. Cut out the hand lettered drink coaster templates. 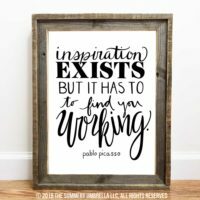 Using your Silhouette CAMEO (or Cricut!) 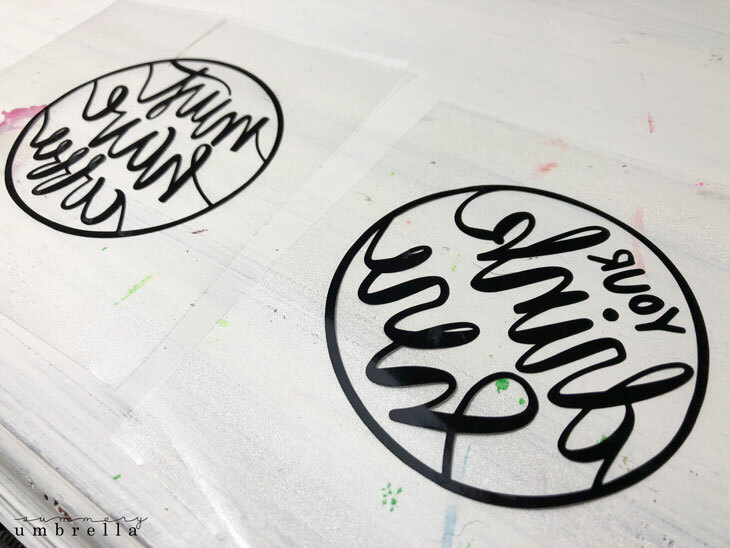 cut out the drink coaster template with the vinyl on your mat. 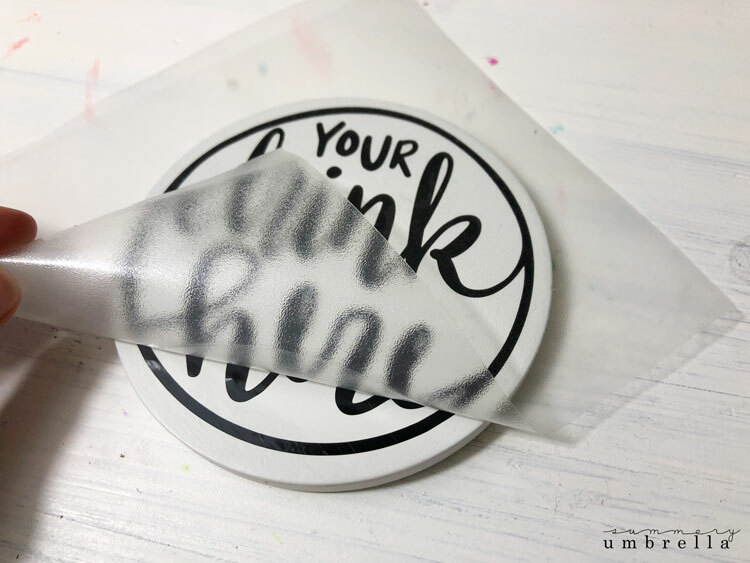 Need help cutting out the hand lettered drink coaster template? Watch this video for step-by-step instructions! 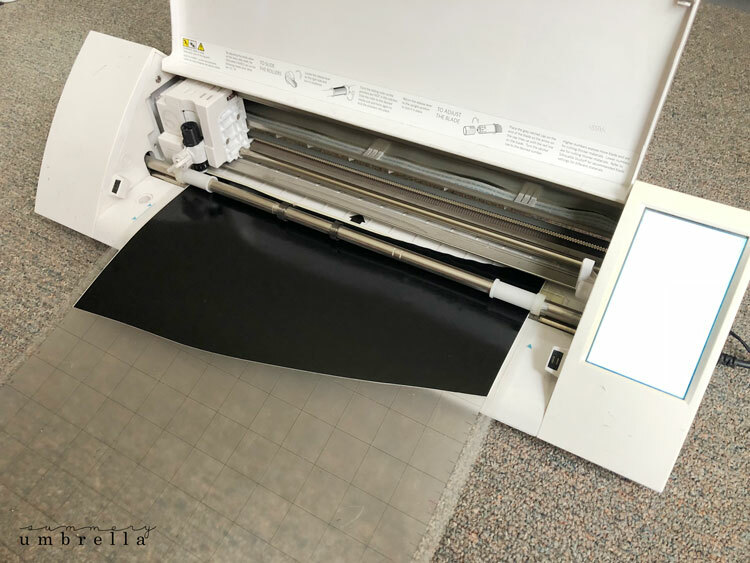 After you’ve cut out your design remove the vinyl from your mat, and apply your transfer tape to the vinyl side. 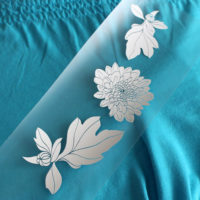 Next, remove the backing from your vinyl, and carefully remove the vinyl pieces around the design. In other words, you’ll just want to be left with the inner words and circle of the design. See below. 5. Apply the design to your coaster. Then, carefully line up your vinyl with your coaster so it goes on evenly, and then firmly push it down with your squeegee. Slowly but surely remove your transfer tape so that only your vinyl is left on your drink coaster. 7. Apply the protective coat. Feel free to use just about any brand of top coat or protectant. However, just make sure that it’s clear. Personally, I used a favorite that I had on hand that I used for my kitchen cabinet update. I absolutely loveeeee this brand! After the first coat has dried you’ll want to add at least one more coat. And that my friends… is all it takes! Wasn’t that easy? Not too much painting, or even a ridiculous amount of steps. This project could definitely be done in one day! 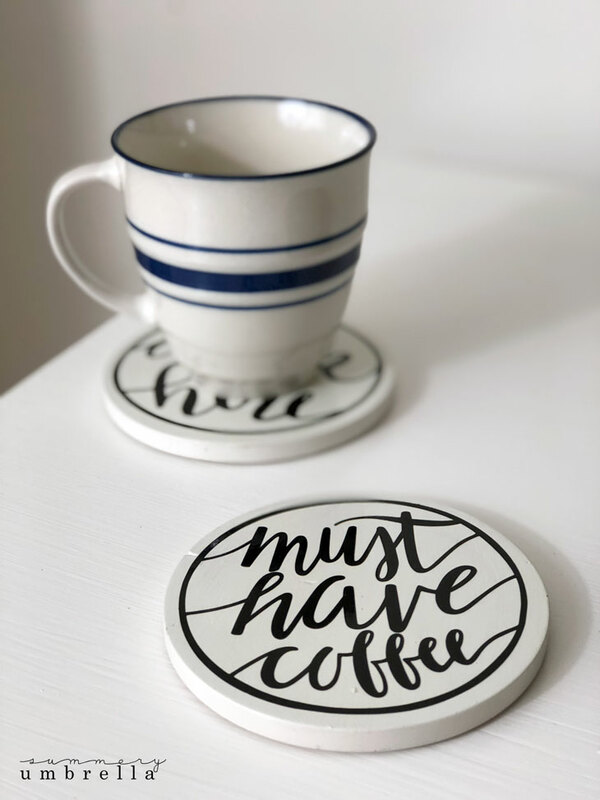 Plus, add a few of these hand lettered drink coasters to a basket, a couple of mugs, a yummy blend of your favorite gourmet coffee, and you have the perfect gift for one of your co-workers, neighbors, or friends who enjoy a good cup of joe! Hope you enjoyed, see you again soon, and have a great weekend!